Most of the 2012 post-mortems have focused on how blind the Romney campaign was to its impending defeat, with good reason. From the demographic resurgence of younger and minority voters to a field operation that had several times the number of boots on the ground to a rigorously tested Election Day get out the vote program, the Obama team had the wind at their back in ways the Republican candidate never seemed to acknowledge over the course of the race. The debates were still fascinating, and worth studying — after all, one of the few things all accounts agree upon is that the first debate in Denver was Romney’s finest moment throughout the entire campaign. If the debates in a race that turned out to not be particularly close can be worth looking at in such depth (as they were in 1980 and 1992), imagine the role the debates played in the closest presidential race in modern history — the Bush/Gore contest in the 2000 election. Everyone knows that election was decided by the slimmest of margins (eventually in the Supreme Court) and that Gore actually won the popular vote while losing the Electoral College, but what part did the debates have in that outcome? Were they crucial to sending the country on a path for eight years of George W. Bush? Heading into election season, it wasn’t at all apparent that the final result would end up being so contentious or so close. The end of the Clinton years continued the economic boom that had sent the president to reelection in 1996, placing Vice President Al Gore in an excellent position to win the presidency as essentially a continuation of Clinton’s administration. 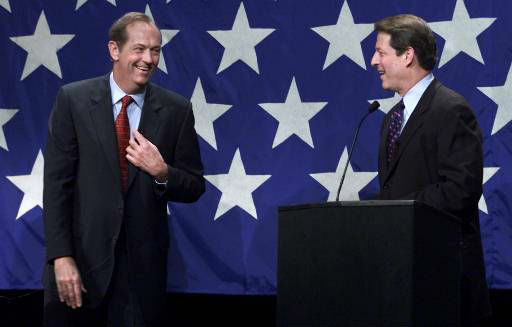 Though several potential candidates considered entering the race (most of whom, such as Howard Dean, John Kerry, and Jesse Jackson, wound up running in 2004), the only politician to actively challenge Gore in the Democratic primary was New Jersey Senator Bill Bradley, who ran to the left of Gore as the liberal alternative to the centrist New Democrat approach favored by Clinton. The dynamic in the primary replicated several other such ideological contests, including the Mondale/Hart primary of 1984, which again explicitly pitted a liberal candidate against a self-styled centrist. In 1984, however, the liberal (Mondale) was the representative of the party establishment, and won the nomination, though not the presidency. In 2000, the party’s next in line candidate (a concept normally associated with the GOP) emerged victorious again. Gore steamrolled over Bradley, winning every single primary race. While the primary may not have been particularly competitive, it was certainly heated, especially on the debate stage. By the time the second to last primary debate rolled around toward the end of February, the candidates were at each other’s throats in increasingly unpleasant ways. The New York Times reported that that debate, held in Harlem at the Apollo Theater, was “politics as spectacle” and that “The two men drew their swords almost as soon as the session began.” Seemingly neither candidate came off particularly well over the course of these exchanges, which, given Bradley’s position in the primary, supported Gore’s contention that Bradley was just trying to “tear him down.” Considering the circumstances of Gore’s eventual loss (and especially the role Ralph Nader’s narrow sliver of the vote played in that loss), the charge was not wholly without merit. Here’s one of the benefits of finally getting to 2000: We can start using The Daily Show’s Indecision coverage to examine some of the more ridiculous moments of the debates, in a different televisual format than the normal televised performance of the debates, or the network/cable news coverage. Here’s how Jon Stewart covered The Apollo debate. It’s interesting to see how fully formed the Daily Show format was: though the segment is not as funny (relying primarily on stereotypes about who would perform at The Apollo Theater), it maintains the basic structure while landing some solid laughs with just clips of Bradley gesticulating wild on CNN. More importantly, the clip makes some more cutting, subtle commentary than viewers might be used to with the Al Sharpton quote at the end. The Republican primary was a different story. Without an incumbent president or vice president, and without a candidate who had previously lost a primary (therefore becoming the “next in line”) the Republican field was wide open. The most established candidates, George H.W. Bush’s Vice President Dan Quayle and former Secretary of Labor Elizabeth Dole, wife of 1996 nominee Bob Dole, chose not to run. The primary field consisted of Utah Senator Orrin Hatch, former Ambassador Alan Keyes (who would later run against Obama for senate), former Undersecretary of Education Gary Bauer, Steve Forbes, and the eventual final two candidates, Arizona Senator John McCain and Texas Governor George W. Bush. The seated format in this debate (moderated by Larry King) makes the candidate appear to be actually having a conversation, a decision that does not reflect favorably on either McCain or Bush. McCain’s constant interruption of Bush, as well as his condescension toward Alan Keyes, does not come off well, even though what he’s saying seems much more reasonable (depending on your politics). Although Bush is not particularly respectful of either of the other candidates, he seems jovial enough that he doesn’t come off too poorly in a cursory viewing. An exchange on foreign policy from the same debate provides a little more insight into the candidate’s relative strengths and weaknesses as debaters, particularly given the seated, conversational format. The intimate setting of this debate actually makes it harder for the candidates to connect with voters — the debate is structured as a conversation between the candidates and King, which means all of their rhetoric is directed at him instead of at the potential primary voters. The relative coldness of the debate format (appearing to be an interview) played to McCain’s weaknesses — he was never particularly good at connecting with voters, and an incentive to talk directly to Larry King made it that much harder. Another thing you can tell from this clip: shockingly, George W. Bush was not a very good debater. He was folksy, sure, but the sort of nimbleness and ability to enact a complex series of strategies (even if pre-planned) combined with on-the-spot thinking that characterizes really successful political debaters (like Reagan) was never really his strong suit. Here, Bush leans heavily on the crutch of “strategic interest” while delivering a rambling answer that sounds, especially in hindsight, like saying America is justified in intervening in almost any region of the world for almost any reason. By the time of the general election debates, the race had taken shape as a remarkably tight contest. Gore was taking steps to distance himself from the Clinton scandals, leading the sitting president to play a minimal role in the campaign to succeed him, even though the economy was doing well. A reduced role for Bill Clinton in a presidential race seems pretty remarkable after his stirring convention speech in the most recent election and substantial advocacy for President Obama’s reelection. In 2008, PBS made a video short narrated by moderator Jim Lehrer going back over the history of the debates. The video is useful primarily for refreshing your memory. Sadly, Gore declined to be interviewed, so most of the video is Bush reminiscing about his triumph with Lehrer, who declines to seriously examine the debates or his own choice in questions. The video does, however cover most of the main stories of the debates, particularly the infamous Bush expression (before they were called Bushisms!) “fuzzy math,” which though it grew to refer to Bush’s tenuous grasp on math (if you were a liberal), was originally deployed to refer to Gore’s apparent propensity for inflating the truth. As we’ve seen in past debates (most notably George H.W. Bush’s watch check in 1992), candidate body language is often far more important than the substance of the answers to questions. Gore’s reputation for being wooden and incapable of connecting with voters on an emotional level heightened scrutiny of his facial expressions and physical reactions to Bush during the debates. In inevitable 2013 fashion, The Atlantic Wire captured Gore’s seemingly obnoxious reactions in the debate in a series of animated gifs. Say what you will about the policy differences between the candidates, Gore comes off as remarkably ineffectual in this exchange, as in many others when he failed to seriously and passionately challenge Bush on “fuzzy math” or the spurious accusation that Gore had claimed to have invented the Internet. We’ve heard throughout the history of debates that they don’t matter, but the relatively small margin of the 2000 election suggests the clear difference in debating ability and charisma between the candidates might have had a more substantial effect than we might otherwise have guessed. Sadly, perhaps the biggest difference between the 2000 debates and the current incarnation of the presidential debate ritual — they largely focused on the growing budget surplus, what Marlo Stanfield would call “One of them good problems.” Listening to Gore argue that the surplus could be used in a “Rainy Day” fund in contrast to Bush’s arguments for lower taxes to give the surplus back to the taxpayers is just reminiscent of the time just before the debates took a turn for the mildly apocalyptic, a development we’ll see in a couple of weeks when Bush goes toe to toe against John Kerry for reelection.